2003 MONTEREY 248LS, The 248 LS montura is the bowrider that knows no boundaries. Huge cockpit and bow dimensions along with an integgrated fiberglass floor liner means easy maintenance and clean up. A thru-transom entryway makes for safe boarding ,as does the itegrated swim platform with ski rope locker and recessed telescopic boarding ladder. The enclosed porta potti is standard as is the cockpit wet bar, Moving forward to the bow section , you'll find the largest and deepest seating of any boat in this class . You will also discover tremendous storage and anchor compartment that contains a forward boarding ladder . Best off all, the 248 LS Montura allows you you to invite along a large group of people to enjoy the fun. low hours, like new,extended swim platform, heavy duty aluminum 10,000 LB. I beam tandam axle trailer, bimini top ,snap on bow cover and cockpit cover , custom made full trailerable cover, 300 hp. 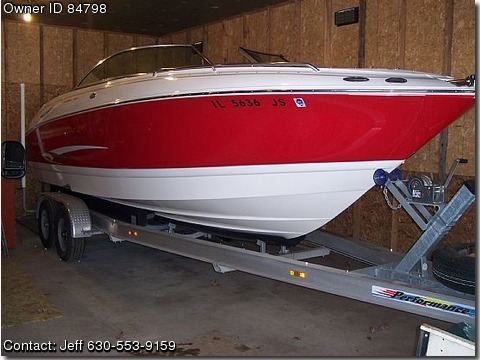 350 mag, bravo III out-drive,spare tire ,trim tabs, very Nice Boat, 43,900 OBO. call (630) 553-9159 or cell (630) 204-3401 ask for Jeff Thanks..